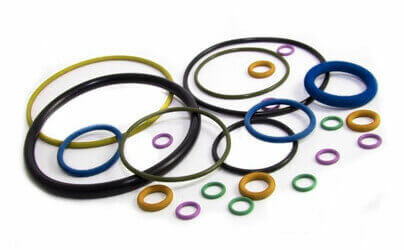 FVMQ ( Fluoro Silicone) rubber has properties very similar to silicone rubber, however it offers added resistance to mineral oils & fuels because of which it is widely used in aerospace applications. Fluorosilicone gives very good low & high temperature properties and because its inert in nature have good resistance to Ozone & UV. Properties : Fluorosilicone rubber gives excellent resistance against weathering, ozone and sunlight making it the most favourite polymer in aviation industry. This polymer also gives best resistance to many oils, solvents has good extreme temperature capabilities. Compatible : To Oils, Oxidizing Chemicals, Ozone & Weather resistance, solvents which are aromatic and chlorinated. Not Compatible : To Phosphate Esters, Amines ( Ammonia ), Some Acids, MEK. Chemical Resistance : Aviation Fuels, Weathering, Animal & Vegetable oil, Dry Heat, Certain Petroleum Oils & Chlorinated Solvents.